As regards music, do the new liturgical rules permit “folksinging” at Mass? Not to be missed are Fr. Rumble’s (surprising!) approval of the old ICEL translations (which did so much harm to the Church for such a long time), his thoughts on singing “Protestant hymns” during Mass, and his intriguing statements about the “ad orientem” posture. LESLIE AUDOEN RUMBLE (1892-1975), Catholic priest, was born on 24 August 1892 at Enmore, Sydney, third son of English parents Harry Humphrey Rumble, civil engineer, and his wife Kate Rosaline, née Knight. Leslie was baptized an Anglican. At the age of 3 he went with his family to Western Australia, where he attended state schools until he was 14. Although there was little religion in the home, his father suddenly became a Catholic in 1908 and insisted that the family did likewise. Leslie was a reluctant convert and after two years reverted to the Church of England. While working as a photographer, he was impressed by a Catholic colleague, rejoined the Catholic Church and felt a call to the priesthood. Judging that Rumble was too English to be happy among secular priests, his parish priest suggested that he try the French Missionaries of the Sacred Heart, in Sydney. The young man entered the juniorate in March 1913. Soon afterwards Harry announced that he and the family had renounced Rome. For ten years father and son maintained a controversial correspondence, until, just before Leslie’s ordination to the priesthood on 26 July 1924, Rumble senior and most of the others returned to the faith. En route to Rome to study at the Dominicans’ Ponteficio Ateneo 'Angelicum’ (D.D., 1927), the new priest gave them Holy Communion. Returning to Sydney in 1927, Rumble taught theology at the Sacred Heart Monastery, Kensington. As part of the preparations for the International Eucharistic Congress, he began in 1928 a Sunday evening programme on radio-station 2UE, answering queries about Catholicism. 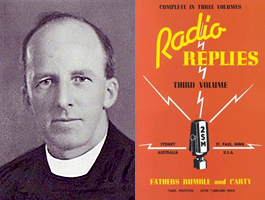 Dr Rumble’s 'Question Box’ was transferred to the Catholic station 2SM and continued until 1968. Interstate Catholic papers carried this material to those outside the range of the radio signal. Four collections of his questions and answers, the first in 1934, sold seven million copies, principally in the United States of America, making him a much-quoted spokesman. He also wrote many pamphlets and magazine articles. Rumble’s knowledge of the varieties of belief (derived from his family’s experience) conditioned him to play fair with questioners, whom he always treated as honest inquirers. Using plain language and short sentences, and avoiding rhetoric, he spoke ninety words to the minute in a voice like worn sandpaper, giving an effect of common sense and rationality. When anyone asked what the Church taught about a specific subject, he quoted the Bible—thus quietly claiming it as the book of the Church. He liked to bring in Protestant authorities to support a case and kept the works of many Protestant authors on his shelves. The shelves were made by Rumble himself, from fruit boxes; just as he repaired his own shoes, he did his own sewing. The simplicity a superior had noted in him as a novice stayed with him to the end. Given a television set, he put it in the monastery’s common-room, watching only cricket and boxing occasionally. His recreation was giving retreats. Advancing glaucoma forced him to retire in 1968. In obedience to his religious superior he collated a final book, Questions People Ask About the Catholic Church (1972), which read like a temperature chart of the Church after the Second Vatican Council. Dr Rumble, although loyal, was not comfortable in that era. He died on 9 November 1975 in Lewisham Hospital and was buried in the Sacred Heart cemetery, Douglas Park.